We’ve seen insane people doing stunts just to have many likes on social media some even die to do it so we advise the readers of this article to seek help from professionals or do not do it at all. However, this man’s action makes it worse, as he tried to be famous and gain likes on a famous social media site, putting an innocent baby’s life in jeopardy The man, who is a relative of the poor boy. 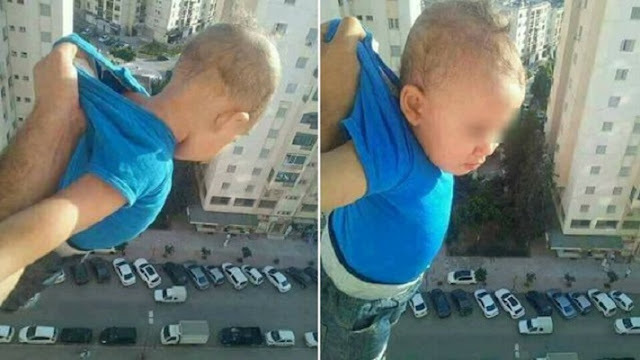 grasping him by the shirt, as the child was exposed from 150 feet above heavy traffic from the 15th floor of the apartment. The shocking photo garnered horrified comments about the photo, with the others fearing for the baby’s life. the innocent baby was simply held by a man through his shirt, which can slip anytime. One of the netizens observed. “what is the most horrifying is that the man is holding the baby with his left hand and taking the photo with his right hand this means the picture is more important than the child’s life. Once taken as a defendant, the man insists that he wad plain a game and that the image was edited to manipulate the eyes of the users. “The picture was taken in a balcony with protective barriers. these were removed,” he said, refusing claims he had put the child’s life in danger.